AP EAMCET 2019 Application Form can be filled till 19th April 2019. 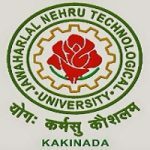 The examination will be regulated by Jawaharlal Nehru Technological University Kakinada on behalf of APSCHE. It is a perfect gateway for those students looking for admissions into various undergraduate professional courses offered by different government and non-government colleges in the state of Andhra Pradesh. Candidates can apply for this exam only through online mode. Through this article, candidates can check the complete step by step procedure of How to Fill AP EAMCET Application Form 2019. AP EAMCET 2019 Application Form can be filled till 19th April 2019 with required late fee. Check here for application details. Candidates can get the AP EAMCET Application Form through online mode only. The application form is available from 26th February 2019. Last date to fill the application form will be 19th April 2019 with late fee. There is no provision to submit and fill the application form through offline mode. Candidates are suggested to keep safe the application for further use. Candidates are required to open the official website of AP EAMCET (link is given above). Click on the link “Online Application”. A new page will open which display the registration fee payment gateway. Candidates can make the fee payment through two modes i.e. visit any AP Online centers or make payment through payment gateway/debit/credit card/net banking. Click on the “fee payment” tab. The fee payment web page will be displayed on the screen. Candidates have to fill Qualifying Exam Hall Ticket Number, Candidates Name, Mobile Number, Date of Birth, Email ID, Stream & Fee Amount. After filling the all the details, click on “Initiate Payment” button. The BANK PAYMENT GATEWAY will shown on the screen. Note: Only VISA or MASTER CARD or MAESTRO card will be accepted. Select the payment type option include net banking (SBI/HDFC)/Net banking(other banks)/credit card/debit card. Fill your card details and click on Pay button. Candidates are suggested to do not double click on buttons, click on back/refresh button and do not close the browser. Confirmation of successful payment will be shown with the “Transaction is successful” item in the below web page “Payment Status” along with Reference Id. and Transaction Id. Candidates are advised to note down the Payment Id for further use. Click on the encircled button “Proceed to Fill Application” and you will be taken to the next screen. After clicking on Proceed to Fill Application button, the new page will be displayed, fill in all the required details and click on Proceed to Fill Application. Candidate Name: Candidates have to enter their name in the provided space if the candidate belongs to other than Intermediate board only. Father’s Name: Candidates have to enter their Father’s name in the provided space if the candidate belongs to other than Intermediate board only. Mother’s Name: Candidates have to enter Mother’s name in the provided space if the candidate belongs to other than Intermediate board only. 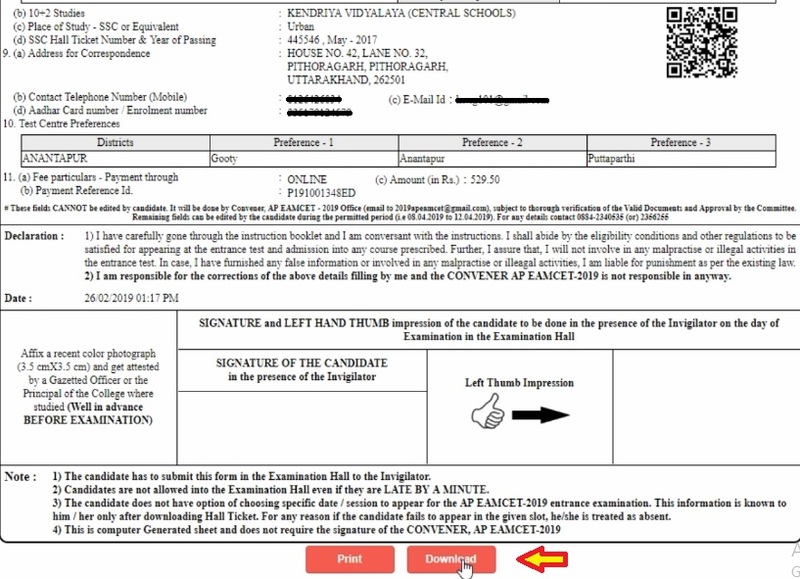 Date of Birth: Candidates have to enter the Date of Birth in the text boxes. Aadhaar Card Number/Enrollment No. : This is an optional item. The candidate is supposed to enter the Aadhaar Card number or the Enrollment number if available. For example, if the Aadhaar Card Number is 499999999999, the same has to be entered. Birth District: Similarly, Candidate have to select the Birth District from the drop down with district names of Telangana / Andhra Pradesh only if the chosen Birth State in the previous item is Telangana/Andhra Pradesh. In case, the Birth State is other than Telangana/Andhra Pradesh, then this item is disabled/frozen and will display as Other state. Birth State: Candidates have to select birth state from the drop down boxes. Ration Card Number: Enter your Ration card details. Category: Select the relevant option corresponding to the Category candidate belongs to as per the Caste certificate. Special Reservation Category: If the candidate belongs to the Special Category, the corresponding option has to be selected by the candidate. Local Area: Select the Local Area you belong. Minority/Non-Minority: The Non-Minority has to be selected if the candidate belongs to the Minority community. Otherwise, if he / she belong to a Minority community, then the Minority option has to be selected by using the Radio button. Annual Income of the Parents (in Rs. ): Select the any one of the three options regarding the “Annual Income of the Parents (Rs.):”. Candidate Bank Details: Candidate have to enter their bank details like Name of the Account, Account No and IFSC Code. Enter your Present/Permanent address with House Number or C/o, Street/locality/village, Mandal/Town/City, District, Pin Code, State, Contact telephone number (mobile), Telephone number (landline) and Email ID. 10+2 Studies: Candidates have to select the College Type where they have studied Intermediate/10 +2 /Equivalent. SSC or Equivalent (10th Class): Enter the SSC or Equivalent Hall Ticket No. and Year of Passing. Place of Study: The candidate has to fill the district details related to his study from Class-6 to Intermediate II year / equivalent in the spaces provided as shown below. However, if a candidate has studied in a state other than Andhra Pradesh, then select OTHER STATE. Stream: Stream will be automatically populated as furnished earlier in EAMCET Fee Payment. Upload Scanned Images: Candidates have to upload their Photograph & Signature if you belong to “Others”. If the student has appeared /passed Intermediate (Regular), then Item Photograph & Signature are automatically populated from the already existing Intermediate database (Note: Only for 2011, 2012,2013,2014,2015,2016,2017 & 2018 appeared / passed). Test Preference: Candidates can opt for preferred EAMCET Examination Test Centers. After filling all the details, verify thoroughly the details and go through the Declaration at the end of the page. Tick on the “I accept the Terms & Conditions”. Click on the “Submit” button to submit the application form. In case if any students have not completely filled their application form, a message box will appear which shows the entries which are not entered or selected by the candidates. The same entries will be listed below the submit button which are not entered or selected by the candidates. When the application form completed and submitted, a message window will appear which will ask you to confirmation to submit the application form. Click on the “Submit” button to finally submit the application form. After final submission of AP EAMCET application form. A pop up window will open, now click on “Print Application”. Now candidates can take a “Print” or “Download” the application form. Note: Candidates are advised to complete fee payment and submit Application Form as soon as possible. This will enable us to allocate the preferred center as opted by candidates. Test Centers are allocated on a first-come first-serve basis. Click here to view Application Form Filling Guide. For further queries related to How to Fill AP EAMCET 2019 Application Form, you can ask us by commenting below in the comment box. What is meant by birth district in EAMCET application? Is it native district or place of birth. Sir i have done till my payment status and I postponed to next day to complete other details.how do I fill that form.I am not getting any link like that.Sir plz say.help me in this. I have applied for JEE. I want to apply to AP EAMCET and the exam dates are both same. How can I appear for exam. Please suggest me. bymistakenly i have done yes for urdu translator but i dont want it…what shall i do now? You can contact to the officials regarding this. Is my caste certificate (belongs to BC-B) to be uploaded along with the application.? or ticking in the relevant box is sufficient. If it is not asked to upload, then don’t upload it. Sir. My eamcet application payment ok. But phone no. Wrong. Application not open. How to chech my paymeny phone number. you should contact the officials. is the income certificate number mandatory? If you belong to any reservation category then select minority. If not then select non-minority. Urdu translator option is for the candidates who want to given their exam in Urdu. Sir, basically I am native from Andhra Pradesh,but I did my schooling from class 6th to 12th in Karnataka,am I eligible for apeamcet? but the eamcet application filled the bank column is blank.please suggest what I do? Sir,No any bank account have my daughter’s,but the eamcet application filled the bank column is blank.please suggest what I do? Sir, please guide in filling CAP details, my father is ex servicemen. Sir, I myself don’t have bank account.. Can we give parent’s bank account details ? I myself don’t have bank account.. Can we give parent’s bank account details ? hello sir,i want a small clarification canditate bank detailes means ,and ration card is compulsoryor or not. I am in T S state. After printing application form .below we need to paste our recent photograph and then what else we need to do?on photograph it must be signed by our college principal where we studied or no need? sir can u please tell me if we can select date for eamcet exam 2017 ? Sir, should we take signature of our principal in the application form? Correction will be started from 28th March 2017. I velong to obc catefory in jharkhand(roniyar bania)…what to fill in category column in APEAMCET FORM as OBC is not showing. You are not eligible. Only TS & AP students are eligible. sir,i have paid the fee through internet banking, but i have not got the payment reference id.i have also checked the payment status but it is showing “payment failed”.what should i do ?.please give suggestion sir.waiting for your response. Sir, is there an option to select the exam date for AP EAMCET? Will they allow me to book the exam slot? Please clarify about AP EAMCET 2017 Exam slot booking,, Didn’t find any date schedule / option for the above..
Sir, I paid fee for application in step no.2 and got reference payment Id. I filled all columns of step 3 but I couldn’t submit the application. There was no Msgs displayed.. Now how can i reuse my remitted payment already..
sir, I have done with my payment today through credit card and received the payment Id. but when I enter the same in the id field for application filling it shows Invalid and also said that service provider will take two working days to consider bill paid in their accounts. Is that the reason for showing Invalid inputs? Sir, my son hemanth sai, while filling the application, he wrote obc inplace of category, instead of bc.now how to change it and any problem in further proceeding? Are caste certificate number and income certificate number are necessary to fill? please help me.. The applicant is of sc category. leave the column of ration card number. sir,is it necessary to fill the student bank details? may i fill my parents bank details instead of mine? I don’t have the Bank Account may I fill my parent account details are not please reply me. You can fill the AP EAMCET 2017 application form from here. Sir, I have applied for AP Eamcet 2016, at the time of filling online application I have not mentioned helpline centre & certificate verification column, further if any problem pl.inform sir. hello sir, i have completed my intermediate with mec stream can i eligible for writing ap eamcet. Can I upload a scanned signature and is there any problem if my photo contains my name and the date of click????? What should I select in the “Local Area Status” column. I’m from Vijayawada, Krishna Dist. Please let me know which option to choose. sir my daughter applied online for ap eamcet, is there any need to send application form to ap convernor? You can check the complete information about AP EAMCET 2016 application form from this link. You can check your eligibility for AP EAMCET 2016 through this link. Sir my father was central paramilitary force and my father’s permanent address is A.P. my sister was study in 7th to10th under CBSE others state and 11&12th study under CBSE A.P,now I wish to known that my sister ,is she eligible to local or nonlocal under EMCET,kindly give me sent a msg pl,about this matter. sir,my father is working at tirupati,AP in railway and having rly.qtr but i have studied at odisha in Kendriya Vidyalaya up to 12th clas.Can i apply for AP EAMCET,medical. Check the eligibility criteria of AP EAMCET 2016 from this link.